TUGboat, Volume 33 (2012), No. 1. David Kadavy, Design for Hackers. Reverse-Engineering Beauty. Wiley & Sons, 2011. 352 pp., Paperback, US39.99. ISBN 978-1-119-99895-2. In the beginning of the book David Kadavy thanks the Wiley acquisition editor Chris Webb for taking up this project, which another publisher dismissed as “ambitious”. After reading the book I could appreciate this story. In 352 pages, the author describes the principles and history of design—the subject that usually takes several semesters of college level courses. If this is not ambitious, then what is? Of course, the book is not intended for a systematic study—rather it is a very popular introduction to whet the appetite of novices and, as Kadavy says, to provide you with a new set of eyes through which you can see the world anew. It is clearly intended for the “new media creators”: web designers, programmers, management of high-tech companies and other people with a good knowledge of computers, but much less of design and arts. Even if they themselves will not become designers after reading the book, they might better appreciate the job of their designer departments. This in itself would be a very good result. Let us see whether Kadavy achieves this implicit goal. The book has nine chapters: (1) Why Design Matters, (2) The Purpose of Design, (3) Medium and Form in Typography, (4) Technology and Culture, (5) Fool’s Golden Ratio: Understanding Proportions, (6) Holding the Eye: Composition and Design Principles, (7) Enlivening Information: Establishing a Visual Hierarchy, (8) Color Science, and (9) Color Theory. It also includes an unnumbered Introduction and two appendices: (A) Choosing and Pairing Fonts, and (B) Typographic Etiquette. Simply from this list of chapters a reader can see that the book discusses in detail typography and fonts. It is not surprising, since David Kadavy taught a college course on typography, and seems to be genuinely interested in the subject. Thus TUG members who share this interest might enjoy and appreciate the book. In my reading, the pages about typesetting are among the best in Design for Hackers; the author is very knowledgeable and knows how to convey his knowledge to the reader. Since the book is written mostly about web design, it talks in length about suitability of various fonts and font features for screen rendering. Design for Hackers has several fascinating asides: why the Romain du Roi letters commissioned by Louis XIV and designed on a “scientific” grid inspired many digital fonts, the story behind the (in)famous Comic Sans, the design principles of the Georgia family, and many others. These stories alone make the book worth reading. The chapters about composition and colors are also well-written and quite interesting. The author teaches these subjects by examples: he takes logos, paintings, web pages and explains why they are successful. This exposition is convincing and might be quite revealing for many novices or even experienced readers. For example, in Chapter 6 the author explains how the details of a classical sculpture or a Seurat painting subtly guide the eye to return to the center of the piece. Then he takes a modern logo and shows the same principles in a quite different situation. Kadavy’s attention to the details and the skill in revealing these details for the reader are superb. Kadavy clearly and lucidly explains many rather difficult topics, such as grid design for books and web pages, coordinating font sizes, relationship between colors, color spaces and printing technology, and many, many others. I would be happy to stop here and congratulate the author and his readers with a very good introductory text on design. Unfortunately, while the publisher provided a bold and dedicated acquisition editor for the book, he seemed to forget about the need for copyediting. Design for Hackers has many paragraphs which an experienced copyeditor would delete or demand be rewritten. Following are just a few examples of such paragraphs. Kadavy twice (p. 3 and p. 46) states that before Gutenberg made books cheap, literacy rates were very low, and few people outside the clergy could read. First, this statement probably does not deserve repeating, and second, it is not quite true. The author himself talks at length about wall graffiti in Pompeii, which demonstrates that in the ancient Roman empire the literacy level was relatively high. Talking about technology and culture, the author spends several pages on the history of Impressionism and Salon des Refusés. The author makes a connection between the new artistic school and the growth of the middle class. A box on page 82 summarizes the take-home message as REMEMBER: In order for a piece of art or design to really be relevant and important it has to be sensitive to the technological and cultural factors present within the world in which the piece is created. Doing otherwise will result only in the creation of a veneer. Does this jejune remark really deserve its prominent place? Immediately after this story Kadavy talks about Web 2.0. What does the author want to say? Is Web 2.0 comparable to Impressionism, and if yes, how? Which social changes are relevant to Web 2.0? Maybe Web 2.0 is, using the author’s terms, just a veneer? One of the most prominent examples of the lack of copyediting is the section SEO Is Design. Nowhere in the body of the book does the author explain what SEO is, and this reviewer was quite baffled by the passionate pleas in the book about the importance of this enigmatic entity. Only in the index is this acronym spelled out as “Search Engine Optimization”: a series of tricks to make your web page go to the top of Google search output. A good editor would likely catch this. A copyeditor could also tell the author that naming two consecutive chapters Color Science and Color Theory is probably not a good idea. Another thing a good copyeditor could do is slightly brush up the style of the author. Kadavy’s writing is generally easy to read. However, sometimes his colloquial style becomes too flippant, and the result looks rather artificial. For example, Kadavy argues that the “golden” ratio is overused and over-hyped, and some other fractions like 2:3 and 3:4 should be used in the design as well. This is fine, but should he really name the corresponding section Fool’s Golden Ratio? Also, sometimes the author veers into sales speak (The corporations pay big bucks for …). Since this book is about design, the design of the book itself should be mentioned. It seems to be highly influenced by web pages rather than by traditional typography: ragged right typesetting, paragraphs separated by vertical white space, lots of colored illustrations, etc. Since the author is without doubt a good designer, the result is surprisingly clean and brisk. Marginal captions for figures look excellent, the colors are selected with great care, and the overall impression is striking. The book is printed on glossy paper (probably necessary because of many color illustrations) and is tastefully typeset in beautiful Adobe Garamond. It is a pleasure to open and read. 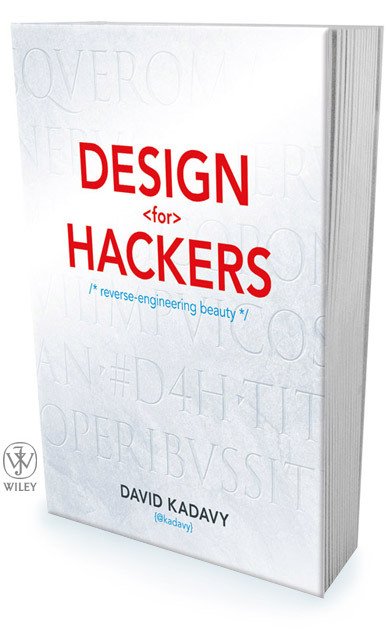 Returning to the question in the beginning of the review, I can say that Kadavy has written a good introduction to design, interesting for novices and giving food for thought to more experienced readers. I would only wish that he had given the same care and attention to the details of his text as to the design and typesetting of the book.